The Average American Drinks 46 Gallons of Sugary Drinks Each Year. These beverages contribute mightily to one’s daily calorie intake. 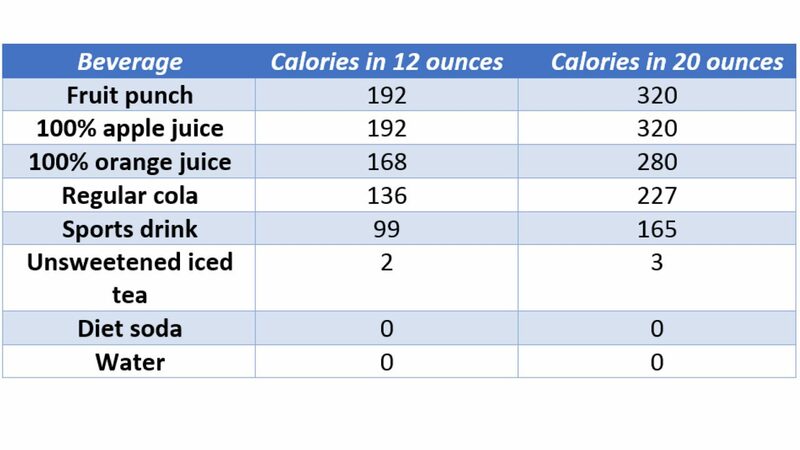 A 20 ounce regular cola, often served with a meal at any fast food restaurant, can add 227 calories to your meal. That’s as much as a Milky Way candy bar. Swapping your regular soda for juice or fruit punch won’t reduce the calories. A 20 ounce fruit punch contains 320 calories. If you are trying to reduce your calorie intake by focusing on food, you may want to rethink your drink, too. Decreasing the number of sugary drinks you consume not only reduces your calorie intake, it also benefits your overall health and lowers your risk for chronic diseases. Just one sugary drink per day increases an adult’s risk of becoming overweight by 27 percent. Additionally, just one sugary drink a day increases the risk of developing type 2 diabetes by 27 percent. Choose water, unsweetened tea, and diet or low-calorie beverages instead of sugar-sweetened beverages. Do not stock the fridge with sugar-sweetened beverages. Instead, keep a pitcher or bottles of cold water in the fridge. Make water more exciting by adding slices of lemon, lime, cucumber or watermelon; if you like added flavor, try a water bottle or pitcher with an infuser core and pack it with different fruits each day. Be a role model for your family and friends by choosing healthy, low-calorie beverages. Here are two recipes for fruit infused water from the California Department of Public Health and the Choose Health LA initiative. Fill pitcher halfway with ice. Add fruit. Fill with water. Chill for at least 20 minutes before serving. Store in refrigerator and drink within 24 hours. The next time you are thirsty, rethink your drink. Your body will thank you.